Description: After deciduous trees lose their leaves and herbaceous plants go dormant, conifers are stars of the landscape. 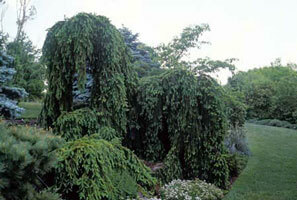 Weeping Norway Spruce is especially attractive drooping over a wall or on a slope. While it may grow 10 feet wide by 3 feet tall as a ground cover, its upright height usually peaks at about 8 feet. All conifers add texture, form and color to the landscape. 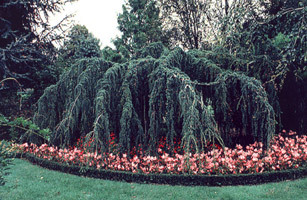 Challenges: Choose the right conifers for your soil type and shelter them from harsh western winds. If you plant a conifer in a perennial bed, remember tall grasses and flowers should not shade the evergreen as it too needs sun. Especially in the first few years, be sure to water well.